Ken Whiting talks with MSNBC about how to motivate a workforce. He took the budget Whiting's Foods would have normally spent throwing an end of the year party and instead spent it on Star Cards that are used daily. The employees didn't have to wait 12 months to be rewarded anymore; instead, now some of them received scratch off cards weekly or even daily! Whenever the employees were seen by a manager doing something positive, they were rewarded on the spot with a scratch off card. Their behaviors and attitudes changed quickly. Employees became motivated, energized, and aware of workplace safety. As a result, the company became more productive and profitable. Scratch off cards work! The Star Card is a scratch off incentive program where employees are handed a card when their manager witnesses them doing something good. Anything can earn them a card; for example, spending extra time with a client, having perfect attendance for a week, making or exceeding quota, having a positive attitude, being safe in the workplace, etc. Whatever issues you have identified that you want to improve with your workforce, that's what you focus this program on. Because your employees are immediately rewarded and recognized for their behavior, it acts as a positive reinforcement. Winning prizes can range from cash to a paid half day off to logo items from your company. The non-winning cards can be collected and entered into a drawing. We have taken the Star Card design and concept and made it available to our clients who wants an existing incentive program that's been proven to work. You can choose from numerous Star Card designs and we'll customize the card with your logos. Delivery within 1 week! Run this scratch off contest for 3 months. You'll notice a significant improvement in just 90 days. 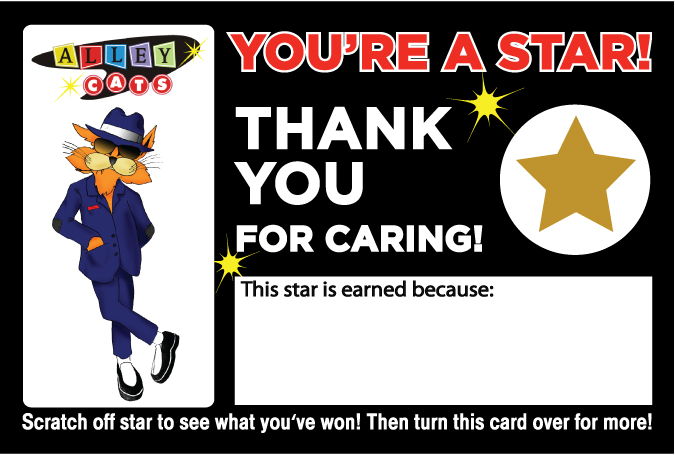 This is a sample of Texas-based Alley Cats Bowling Alley who adopted the Star Card program. It uses the same Star Card layout as Whiting's Foods, but the logos and prizes have been customized for Alley Cats. "This program works because it's about immediate recognition & gratification." golf trips, resorts & golf courses. these cards will be a hit!" The hottest fundraiser in golf today! the same day they're ordered! GOLF TODAY MAGAZINE: This is the new Fantasy Golf Scratch Off Card which I’m positive you’ll be seeing a lot more in the future. This scratch off card is just like any score card found at any golf course, except you don’t have to drive to the course and you don’t have to drive to the course and you don’t have to play the game itself to shoot that coveted 65. All you have to do is scratch off one of the four circles provided directly underneath each hole, and then tally up your score. If you’re in a group of golfers and top prize for lowest score is a round-trip all-expense paid golf trip to Kauai, you win! Some contest hosts will even give prizes for the highest score as well, since this is strictly for fun and for prizes. It’s up to you how you run the contest! Give away prizes for the highest score scratched off, the lowest score, most pars, most eagles, etc. It’s a great way to make money at charity tournaments, because you can sell a card for $1, or five cards for $3 and 10 cards for $5, with the money itself going to the charity itself. But feel free to charge whatever you want for these cards - it’s up to you! A worthwhile prize like a set of new Nike Irons donated by a golf business or golf organization is the grease that sells these cards and makes this wheel go smoothly and without a hitch. I myself obtained more than 5,000 of these cards so that all the players in one of Golf Today Magazine’s sponsored tournaments can have yet another way to win some of the fabulous prizes given at each tournament. The cards will be given free to all participants. The Fantasy Golf Cards can be used for much more than at tournaments, and I’m talking about for use at golf shows (both trade and consumer), I’m talking about for golf trips, and how about at golf resorts and golf courses? Anywhere golfers congregate, these Fantasy Scratch Off Cards will be a hit! Fantasy Scratch Off Cards can be obtained in generic form or custom-made for your golf group or the special golf event. On one-half of the back of the scratch off card is space for the promotion of an advertiser or sponsor of the event, which is yet another way to raise funds for the charity tournament. A Deluxe Dedicated card has everything customized on it, including the golf course, a picture of one hole on the course, the exact yardage, tournament logos and sponsors’ logos. No two Fantasy Golf cards are alike since there are more than 20 million numerical combinations. Every card is a potential winner! (Scratch Off Works will give you the odds for your contest). Clients can order as few as 100 cards on up to over 500,000 cards. Delivery takes only one week.